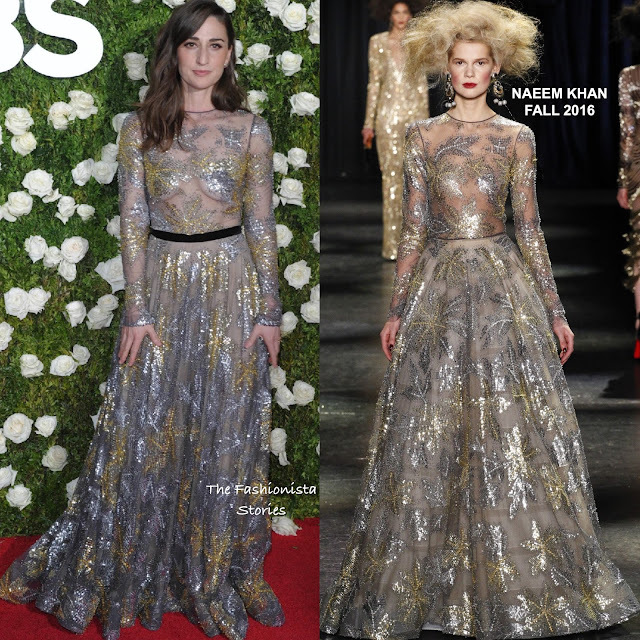 On hand as performer, Sara Bareilles hit the red carpet this evening(June 11th) at the 2017 Tony Awards at Radio City Music Hall in New York. For her look, she turned to NAEEM KHAN wearing the designer's FALL 2016 long sleeve sheer silver & gold sequin gown which was lined for coverage. On the runway, Sara's gown didn't featured a waistband but a contrasting black velvet waistband was added to her gown. I like the addition of the waistband as it balance out her look. However I would have loved to see her with a colored lip and a side swept, pinned up-do. What do you think of Sara's look?